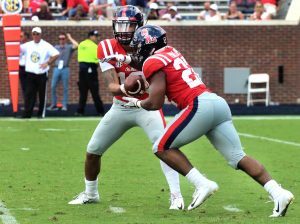 Ole Miss fought through sloppy play and sloppy weather to secure a 38-17 win over Kent State on Saturday. The Rebels and Mid-American Conference Golden Flashes endured two lightning delays, one at halftime and one in the fourth quarter, before the 11 a.m. game reached its conclusion at 4:40 p.m. Although his offense got off to a slow start, only scoring seven points in the first half, Matt Luke was proud of his team for bouncing back after a 55-point loss to top-ranked Alabama last week. On the subject of defense, Saturday marked the first time an Ole Miss team has held an opponent to fewer than 21 points since Sept. 24, 2016, against Georgia, snapping a 23-game streak. 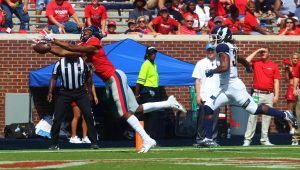 In a change of pace, the Rebels’ most notable issue on Saturday was a lack of production on offense early in the game. The Rebels had a noticeably sluggish start, punting on four of their first six drives and allowing a Luke Logan field goal to be blocked late in the first half. The Rebel offense turned it around in the second half, however, scoring four touchdowns and a field goal to pad their lead. Once the offense started, however, it could not be stopped. D.K. Metcalf hauled in a highlight-reel, one-handed catch for a touchdown in the third quarter and broke the century mark in receiving. Running back Scottie Phillips also rushed for over 100 yards for the third time this season. Phillips also found pay dirt twice, once through the air and once on the ground. After the game, Phillips gave credit to his teammates and offensive line for his success. defenders and open holes for me,” Phillips said. Although the Rebels were pleased with their bounce-back performance this weekend, the road only gets tougher from here. Ole Miss travels to Death Valley in Baton Rouge to take on top-ten LSU. Phillips said he is looking forward to the opportunity to play LSU on national television in a hostile environment. Kickoff next week in Baton Rouge is set for 8:15 p.m Saturday. After their trip to Death Valley, the Rebels return home to face Louisiana-Monroe in their homecoming game.